Pull ups are one of the best body-weight exercises you can perform. They work your back, core, arms and shoulders, all without requiring much in the way of equipment. If you have a hard time performing pull ups correctly (or at all), you may just need a few pointers on how to build up your strength to perfect your pull up form. Grasp a pull up bar with your arms slightly wider than shoulder-width apart and your palms facing away from your body. Lift your feet off the floor. Tighten your back and biceps muscles, and squeeze your shoulder blades together as you pull torso toward the bar. 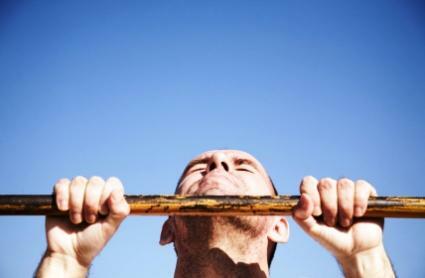 Lower yourself back to the starting position in a careful and methodical manner, after your chin reaches bar-height. Jumping off the ground to start your pull up - A tiny hop the first time might be acceptable, but if you're regularly using your body's momentum to start the movement, you need to develop greater upper body strength. Allowing your body to "fall" from the upward position; in other words, you don't control the downward movement. Not only could this increase your chance of injury, it's also robbing you of one of the best opportunities for improving your pull up strength. The downward motion requires that you work against gravity. Even if you struggle to pull yourself up, if you force yourself to lower slowly, your back and biceps muscles will gain substantial strength over time. Giving up because it's too hard. You don't have to perform a set of 15 repetitions to benefit from the pull up exercise. If you can't perform a full pull up, don't give up, just modify the exercise so that you can reap the benefits and gain more strength. Perform the downward phase only. Place a chair or a bench under the pull up bar and stand on the chair or bench so that you can start the movement with your chin at bar height. Grasp the bar and tighten your back. Lift your feet off the bench and very, very slowly allow your arms to straighten and lower your body toward the bench. When you reach the bottom of the movement, stand back on the bench and perform the exercise again. Use a modified pull up machine. Most gyms or fitness centers offer a modified pull up station. Using the machine, you can stand or kneel on an appendage and lift and lower a portion of your body's weight, rather than your entire bodyweight. This allows you to perform the full pull up motion, but with greater ease. If you choose this option, make sure you continue to push yourself to gain strength so you can wean yourself off the machine over time. Smith machine pull up. You can use a Smith machine or any other sturdy bar that's roughly belly-button height to perform this exercise. Grasp the bar slightly wider than shoulder-width apart, your palms facing down. Step your feet forward and under the bar until your shoulders are directly under the bar and your arms are perpendicular to the floor. Adjust your feet so your legs are straight and your body forms a straight line from your heels to your shoulders. Tighten your back and squeeze your shoulder blades together as you pull your chest toward the bar. When your chest meets the bar, lower yourself in a controlled fashion back to the starting position. Repeat as many times as possible. Modified pull ups are the perfect precursor to traditional pull ups, allowing you to gain strength so that you can perform traditional pull ups correctly. If you want to become better at performing pull ups, you need to regularly incorporate them into your workout. Plan on adding a pull up exercise to your regular strength training routine at least two to three days a week, allowing for a day of rest between exercises. Make sure you're always working yourself to exhaustion - the last one or two pull ups should be almost impossible to perform. Every week or so, add additional repetitions to your pull up sets or make the movement more difficult by adding weight or progressing to the next pull up modification exercise. You'll be surprised at how quickly you begin to see improvements in your pull up form and function.